Shelene Bryan had it all--a wonderful husband, two great kids, a rewarding job, a dream home, and more. Then a friend saw the pictures on the refrigerator door of the two African kids Shelene's family sponsors and she asked, "How do you know those kids are real?" That question changed Shelene's life forever. 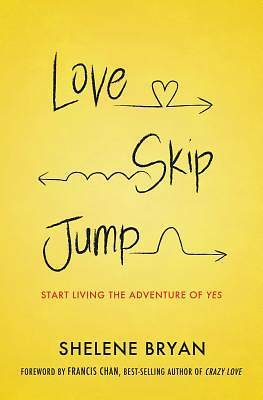 In "Love, Skip, Jump, " Shelene shares how she loved being safe and comfortable. She had "no" desire to leave the USA. But she couldn't shake the question and soon after was on a plane to Africa. She said yes to God, and not only met the kids her family sponsors but opened herself up to the journey God had been preparing for her, including founding Skip1.org, a charity that provides food and clean water to children around the world. "There's only one thing we need to get right: to know and follow hard after Christ," Shelene says. "When you're uncomfortable, you need God in a whole new way. His quiet voice can finally be heard." Some of the most amazing things God wants to do in our lives involve allowing him to take us on uncomfortable journeys. God is at work all around us. We don't need to leave the country to see that. We just need to open our eyes. Comfort and safety are the biggest life-obstructing conditions of our current generation. What is holding you back from jumping in with your Creator?